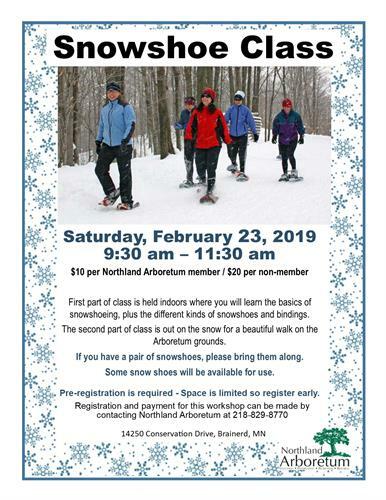 The Northland Arboretum will host a snowshoe class on February 23. The first part of the class is held indoors where you will learn the basics of snowshoeing, plus the different kinds of snowshoes and bindings. The second part of the class is out in the snow for a beautiful walk on the Arboretum grounds. If you have snowshoes please bring them along. Some snowshoes will available for use. Registration and payment for this workshop can be made by contacting the Northland Arboretum at 218-829-8770.